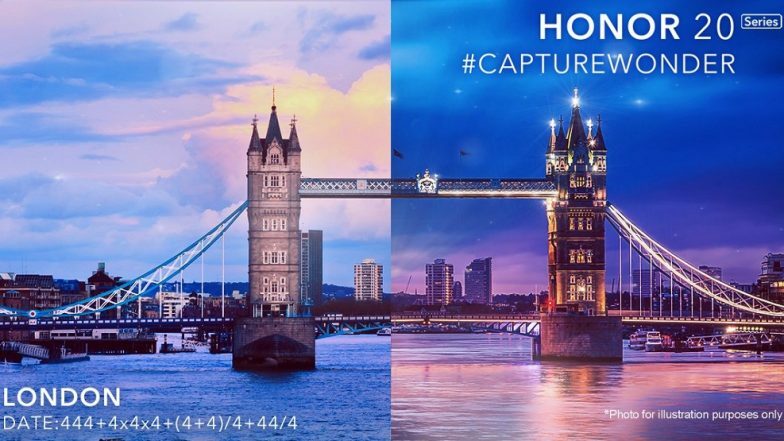 New Delhi, April 15: Chinese smartphone maker and Huawei's sub-brand Honor on Monday announced to launch a new "Honor 20 series" globally at a London event on May 21. There will be a couple of industry-first smartphones across price-ranges, and will hit the India market later, the company informed. Honor 20 will be a flagship phone with the Kirin 980 processor. Xiaomi Redmi Y3 With 32MP Selfie Camera Scheduled To Launch in India on April 24. "It will have a 32MP selfie camera, a 3,650mAh battery and run Android 9 Pie out of the box. There is no info on the Honor 20 Pro but we expect a bigger display, a bigger battery, and a different camera configuration," reports GizmoChina. Realme 3 Pro Smartphone India Launch Date Confirmed.